Heat large skillet or griddle over medium-high heat, greasing if necessary. In large bowl, mix Bisquick mix, granulated sugar, cinnamon, cloves, nutmeg and ginger. Stir in eggs and milk. For each pancake, pour 1/4 cup batter onto hot griddle. Cook until bubbly on top and set on edges. Turn; cook other side. To make whipped cream ghosts, whip cream until thick. Slowly add powdered sugar, and continue beating to stiff peaks. Transfer whipped cream to decorating bag. 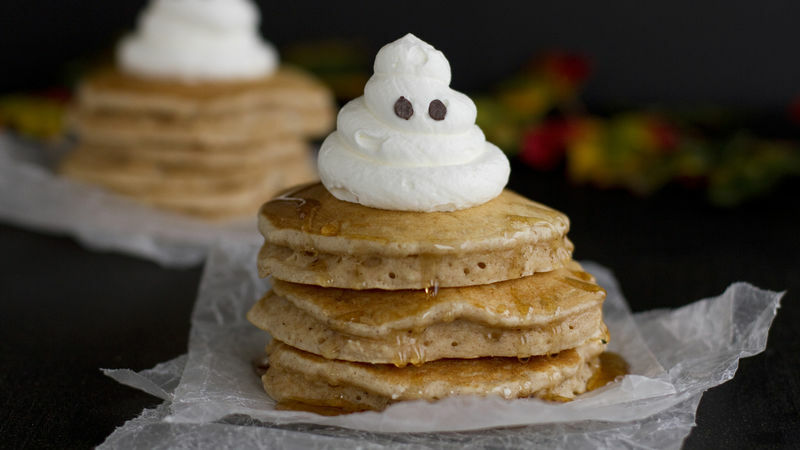 Pipe ghosts on top of pancake stacks, and adhere 2 chocolate chips for eyes on each. Substitute 1 teaspoon pumpkin pie spice for the individual spices. The pancakes are equally delicious without the ghosts.